I received this picture yesterday. 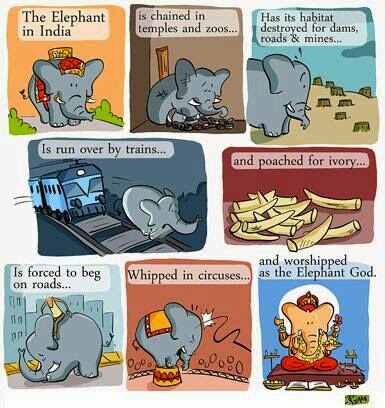 It is an innocuous little thing - the sad irony of an elephant in India. Usually, one would just dismiss it as humour, but somehow, as I read it, it smacked of hypocrisy to me. Yes, the elephant does have trouble in India and yes,we do indeed worship an elephant headed god (atleast the Hindus do). We also worship a monkey and we worship many other things. After all Hinduism is a polytheist religion apart from animals, we worship forests, trees, lakes, mountains and then some. We even worship the sun, fire, water...the list goes on and on. Why people do what they do - is a matter of policies, punishments, incentives, behaviour and so on and so forth. The second and bigger issue here is that all animals - face a very bad situation under humans. Either we have tamed them (which may be a lesser evil) or we breed them for food, hunt them down to extinction or hunt them for various beliefs or skin or tusk or use them to test poisons and toxins in the name of research. Even if you are a vegeterian, there is a high likelihood that animals are harmed directly or indirectly because of human existence. So, if you can, become vegeterian - at least direct impact is lowered. If you cannot, try to save animals, their habitats etc. Whether you pray to a god or an animal has precious little to do with it. Now replace the statement with women. Yes, as a religion we worship women. And yet whether it is a religion that worships or does not worship women - either of them do commit atrocities on them. Does that make any side less guilty? Or is the praying hypocritical? Or is there is no real connection at all? And whether you pray or you do not, the crime remains one to be punished for? And while I am all for mocking all religious beliefs, as humans perhaps we need to live lightly, tread lightly on the earth while we are at it, given that our existence itself is hypocritical.